Regardless of one’s beliefs about how the 2008 Presidential Election ranks among other historic elections, it was certainly the most active and actively watched money race in the nation’s history. The $1.75 billion raised by presidential hopefuls from both parties more than doubled the amount raised during the 2004 Presidential Election. The surge of candidates declaring their intentions to run within months of the 2006 Midterm elections and the storied showdown between the Obama and Clinton campaigns for the Democratic nomination led to a primary season that started earlier and ended later than any in recent memory. All of this provided a seemingly endless stream of contribution data that, among other things, is ideal for tracking the ideological progression of the candidates over the course of the election. The figure below combines the IMWA with smoothing techniques to get an idea of how the election progressed. 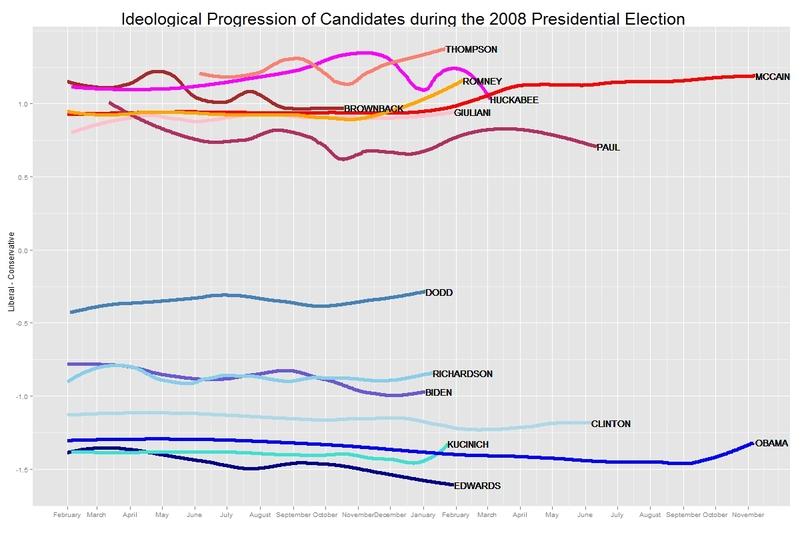 Ideological Progression of Candidates during the 2008 Presidential Election: The presidential candidate trends are estimated in a two-step process. This first step recovered ideological estimates from an IMWA scaling that included all contributions from the 3125 PACs and 131,000 individuals that gave to two or more federal campaigns during the 2007-2008 Election Cycle. Holding the contributors estimates static, the presidential candidate trends are then smoothed over time using locally-weighted regression (LOESS) with a span of .3. Although the plot largely speaks for itself, there were a few features that caught my attention. The first is that, with the exception of Biden and Richardson, the Democratic candidates generally maintain a consistent rank ordering, whereas the ordering of the Republican candidates is much more chaotic. The second point of interest is the Obama campaign’s move to the center during the run-up to the general election. I would venture to guess that this was this was the combined effect of Sarah Palin’s VP nomination and the financial meltdown, but that is just speculation. Partisan giving rates have long been the standard measure of contributor ideology. Measured simply as the percentage of funds a contributor gives to Republicans/Democrats, the partisan giving rate is a straightforward, easy to understand and generally useful measure of contributor ideology. Although it is a great place to start, it is a far rougher approximation of ideology than most people realize. (-0.5*1000 + -0.1*500 + -0.4*1500)/(1000+500+1500) = -0.383. MPR’s method of estimating the ideal points of contributors is a simple yet powerful tool. Nonetheless, its reliance on DW-NOMINATE scores limits which contributors and candidates can be included in the model as well as what we can take away from the results. Notably, it excludes contributions to unsuccessful candidates that never hold office and compile a voting record. The Iterated Money-Weighted Averaging (IMWA) procedure takes the MPR procedure a few steps further. If we can estimate the ideological positions of contributors based on the ideology of the recipient candidates, there is no reason why we cannot simply flip the procedure on its head and recover ideological estimates of candidates based on the ideology of their financial supporters. This results in a more inclusive ideological map of campaign finance that is not reliant ideological scores of candidates recovered from voting records. 1) Set the ideal points of all Republicans candidates to 1, Democrats to -1, and independents to 0. 2) Estimate contributor coordinates as a function of the money weighted averages of their contributions. 3) Estimate legislator coordinates as a function of the money weighted averages of their contributors. 4) Normalize legislators to have a mean of 0 and a standard deviation of 1. 5) Go to step 2; repeat until convergence. To illustrate, I include results from a scaling of the 2008 Election cycle that uses data from all individuals and PACs that contributed to two or more unique candidates. 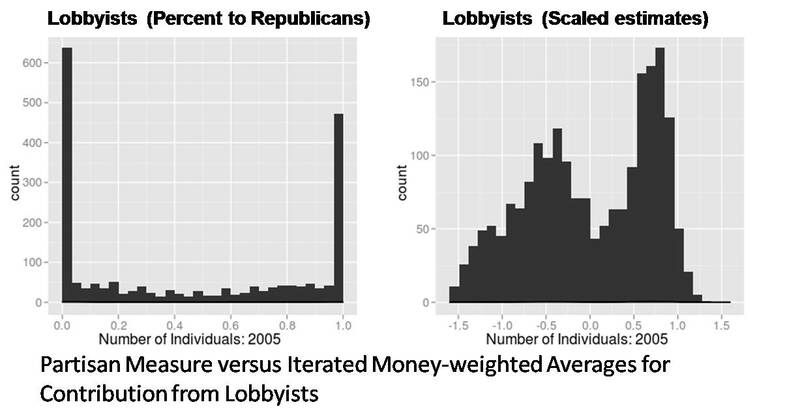 The figure above compare the ideological distributions of lobbyists, an important category of individual contributors, first derived from the partisan measure and then from the IMWA measure. The partisan measure lumps most lobbyists at either 0 or 1, representing the preponderance of partisans lobbyists that give exclusively to Democrats or exclusively to Republicans. The IMWA estimates provide a much more fleshed-out portrayal that should lead to more informed inferences. For example, while lobbyists are clearly polarized, the IMWA distribution reveals that lobbyists are not as polarized as the partisan measure suggests. In fact, lobbyists are one of the least polarized industries. It also appears to be the case that liberal lobbyists are more dispersed than their conservative counterparts on K Street. In other words, the IWMA estimates are better able to account for something that is painfully obvious to anyone who follows politics, that ideology is not uniform across members of the same party or their supporters and that it is possible for one party to be more dispersed than the other. The “no frills” IMWA method is not the only way to construct an ideological map of campaign finance. There are plenty of alternative approaches, most some slight variation on correspondence analysis, although more sophisticated statistical methods exist as well. The take-away is that no matter how one slices it, campaign finance data is rich in ideological content waiting to be unlocked and explored.